ChessOK Aquarium is a revolutionary analysis, database and chess publishing tool, fully compatible with the world’s strongest chess playing engine, Houdini 3. ChessOK Aquarium combines an easy-to-navigate interface with advanced analysis functions, game commenting, searching, powerful chess trees, playing against the computer, databases, advanced publishing options and many other features. Despite having numerous functions and customization options, Aquarium is easy to use navigate – thanks to a modern interface employing the Ribbon – an element you may be familiar with from the latest Microsoft Office products and some other modern programs. It provides means to make all options easily accessible without limiting the number of options. The biggest news introduced in Aquarium is the improved integration of IDeA and infinite analysis. The first steps in this direction were taken in Aquarium 4. The most important of those was the introduction of IDeA game links (see IDeA Master Trees and IDeA Game Links), which added a new level of convenience by creating an “analysis center” where IDeA is accessible along with other Aquarium analysis tools such as infinite analysis, without the need to switch back and forth between the game and IDeA. Aquarium takes the integration one step further by sending infinite analysis results automatically to the IDeA queue or even directly to the IDeA project tree without the need to re-analyze the positions in IDeA. This means that if you run infinite analysis in a game linked to a project, the variations produced by the engine will be compared to the positions in the project tree; and if they haven’t been analyzed, they will be sent to IDeA. The infinite Analysis in Aquarium is as solid as ever. In fact the users that gain most from the improved analysis features in Aquarium 2012 are those who use infinite analysis. With the improvements in Aquarium 2012 you can automatically keep track of all your infinite analysis broken down by chess engine. If you want to check a previously analyzed position at a later time, you can see how it was evaluated by each of the chess engines used to analyze the position. 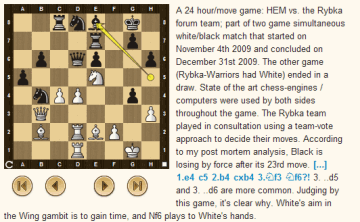 For more information and detailed guides, refer to the related articles at chessok.com. I’ve been looking at the new CAP analysis that comes with Aquarium 2012. For those who are not familiar with the CAP project, it is a chess tree (position database) with chess engine evaluation of fifty-five million positions. Each position is analyzed for one minute and the results are minimaxed. IDeA users will probably realize that the quality of such analysis can be quite good and in general the CAP evaluations after the early opening seem to reflect the possibilities of both sides quite well. One of the new features of the Aquarium 2012 CAP database is the analysis of the first twenty-five moves of all high-rated correspondence games from the ICCF game archive. Therefore, it is worth keeping an eye on the CAP scores while browsing the games. Naturally, a high rated correspondence player can’t rely entirely on CAP evaluations when selecting moves. Move selection in correspondence games requires much deeper analysis. However, a key factor in modern correspondence chess is to find positions that are initially evaluated favorably by chess engines, but can be shown to be dangerous after deep and careful analysis. CAP can be helpful in picking out such positions. A detailed overview of the latest version of Aquarium: Part 1, Part 2.